"Opened in 1995, it is helmed by chef Tatsu Nishino, formerly of Matsuhisa Restaurant in Los Angeles, who turns out dishes like thinly sliced kampachi with ponzu sauce, and soft-shell crab spring rolls. It may seem impossible to leave room for the super-fresh sushi, but you should try anyway. " 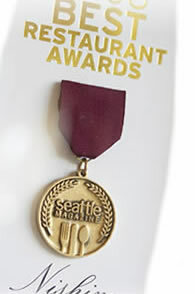 "Zagat has ranked its 20 top-rated restaurants across the country, and #1 in the Seattle area is Nishino in Madison Park." The well-maintained blondes and tailored-fleece-attired clientele at Madison Park's Nishino shouldn’t intimidate those of us who are rougher around the edges: The service at this Madison Park restaurant is always kind (even to kids! ), and Nishino’s kitchen produces consistently beautiful sushi—impeccably fresh, cut with samurai precision and cushioned on beds of exquisite rice.